Start off your visit on the 21st (Sun): take an in-depth tour of Archaeological Museum of Mykonos. For ratings, more things to do, reviews, and other tourist information, read Mykonos Town trip maker site . London, UK to Mykonos Town is an approximately 4.5-hour flight. You can also do a combination of train, bus, and flight; or do a combination of bus and ferry. Due to the time zone difference, you'll lose 2 hours traveling from London to Mykonos Town. Plan for somewhat warmer temperatures traveling from London in April, with highs in Mykonos Town at 22°C and lows at 16°C. Wrap up your sightseeing on the 22nd (Mon) early enough to ride a ferry to Akrotiri. Kick off your visit on the 23rd (Tue): kick back and relax at Red Beach, then ride a horse along Santo Horse Riding, then learn about winemaking at Boutari, J., & Son Wineries S.A., and finally delve into the distant past at Akrotiri. To see maps, where to stay, more things to do, and tourist information, refer to the Akrotiri trip app . Getting from Mykonos Town to Akrotiri by ferry takes about 2 hours. Expect a daytime high around 23°C in April, and nighttime lows around 15°C. Wrap up your sightseeing on the 23rd (Tue) to allow time to ride a ferry to Heraklion. 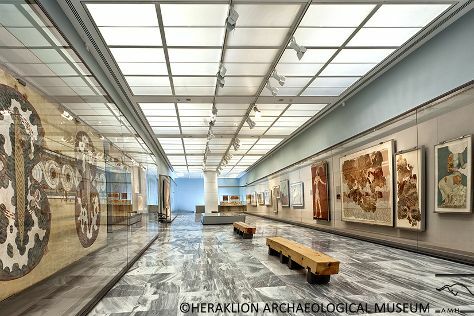 On the 24th (Wed), get engrossed in the history at Ιστορικό Μουσείο Κρήτης - Historical Museum of Crete, take an in-depth tour of Heraklion Archaeological Museum, and then delve into the distant past at The Palace of Knossos. To find where to stay, ratings, and more tourist information, go to the Heraklion day trip tool . Traveling by ferry from Akrotiri to Heraklion takes 2 hours. In April, daily temperatures in Heraklion can reach 24°C, while at night they dip to 14°C. Finish your sightseeing early on the 24th (Wed) so you can travel to Athens. Athens is known for historic sites, museums, nightlife, shopping, and fun & games. Your plan includes some of its best attractions: steep yourself in history at Acropolis of Athens, explore the ancient world of Temple of Olympian Zeus, get great views at Mount Lycabettus, and admire the masterpieces at National Archaeological Museum. To see maps, where to stay, ratings, and other tourist information, read Athens trip itinerary planning tool . Traveling by combination of bus, flight, and subway from Heraklion to Athens takes 3 hours. Alternatively, you can do a combination of ferry and taxi; or ride a ferry. In April, daytime highs in Athens are 24°C, while nighttime lows are 15°C. Finish your sightseeing early on the 28th (Sun) so you can drive to Kalambaka. 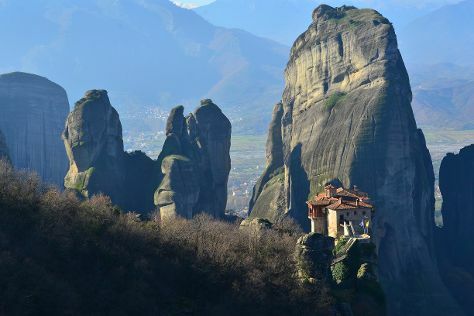 On the 29th (Mon), take in the spiritual surroundings of Holy Trinity Monastery (Agia Triada), take in the spiritual surroundings of Monastery of the Great Meteoron, and then make a trip to Meteora. For photos, more things to do, traveler tips, and tourist information, refer to the Kalambaka online travel route builder . Drive from Athens to Kalambaka in 4.5 hours. Alternatively, you can take a train; or take a bus. Traveling from Athens in April, things will get a bit cooler in Kalambaka: highs are around 20°C and lows about 7°C. Finish your sightseeing early on the 29th (Mon) so you can drive to Delphi. Kick off your visit on the 30th (Tue): take in the spiritual surroundings of Tholos, delve into the distant past at Temple of Apollo, then take an in-depth tour of Delphi Archaeological Museum, and finally contemplate the long history of Delphi. To see reviews, traveler tips, more things to do, and more tourist information, go to the Delphi trip builder . Getting from Kalambaka to Delphi by car takes about 3.5 hours. Other options: do a combination of train and taxi. In April, plan for daily highs up to 24°C, and evening lows to 9°C. Finish your sightseeing early on the 30th (Tue) to allow enough time to travel back home.